Fixed up some broken images 2018-10-01. I’ve been experimenting with electronic fashion since about 2012. In that time I’ve never produced a finished garment that someone might want to wear. I’ve just created example pieces showing the techniques and/or capabilities of the technology. This year I wanted to do something different and have something real to show at the many maker events I go to throughout the year. The problem is that I only have a limited set of hand sewing skills. The solution was to find a person to collaborate with. That person has turned out to be my mother, Dolores Fitzsimons. She has over forty years working in the Irish fashion industry as a pattern maker and designer. I think that makes her very qualified to help me implement my design ideas. We began by looking at some of my existing example pieces. We found the LEDs to be a bit harsh and they would need to be toned down a bit in a finished garmet. Experimenting with placing layers of different fabric in front of the LEDs, gave some promising results. We visited some local fabric stores in Dublin, and found that Organza fabric produced a very appealing diffraction effect when a clear LED light shines through it. So after some more design discussions and these visits we decided to start off with something small and design a dress for a young child. The outer layer is an interesting red Organza fabric with a textured silver swirl pattern, with red netting layered on a red cotton fabric. 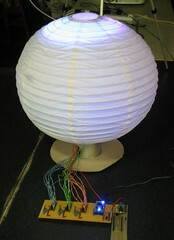 The electronics are 24 red LEDs, driven by a 3 SEWIO8‘s and a LilyPad Arduino USB micro controller. The dress should be suitable for girl about 3 to 4 years old. More details of the design and construction can be seen in the photo album. The second dress is made with a body of white Duchess Satin, a sheer neckline in white Organza and a multi layered flared over skirt in white Organza. The dress body is fitted, has princess seams and a curving high-low hemline. The electronic are 28 SEWRGB pixel’s which circle the body following the curve of the high-low hemline and a LilyPad Arduino USB micro controller. The intention wasn’t to make a wedding dress but it could be used as one. More details of the design and construction can be seen in this photo album. In May (May 17-18) I’m heading to Maker Faire Bay Area for the first time, one of the reasons for wanting to create some real garments. Later in the year I’d like to show my designs at Dublin Maker and Maker Faire Rome.